It is essential that all form liner is stripped with an equal time interval from concrete placement. Different time intervals will result in inconsistent coloring from different levels of moisture loss. For best results, forms should be stripped within twenty-four hours of concrete placement. Formwork should be stripped perpendicular to the form, when possible. Tilt-up Panels should not be lifted until the concrete has reached the specified concrete compressive strength. In most cases, the form liner will remain on the slab. Single-use liners can be discarded after stripping while multi-use liners can easily be cleaned by spraying with water and/or scrubbing with a brush. As with plastic liners, ElastoSpec Liners should be stripped perpendicular to the form, with an equal time interval from concrete placement, and within 24 hours. When stripping ElastoSpec Liners, the material resiliency can be used to allow the formwork to strip itself. Use a hydraulic jack to separate (push) the top of the formwork from the concrete. Allow the jack to remain in place for approximately 15 minuets. The formwork will slowly resume its original shape and strip itself away from the finished surface. If jacking is not possible, a stripping force can be used on the jack side of the form to separate (pull) the top of the formwork from the concrete. The stripping angle should always be as perpendicular to the form as possible. The use of a form release is recommended in all liner types and applications. Spec Release works well to aid in stripping and ease clean-up of the form liner for additional pours. Release agents should be applied as closely as possible before concrete placement. For best results, the liner should be cleaned after each use and a new coat of form release should be applied before each concrete placement. 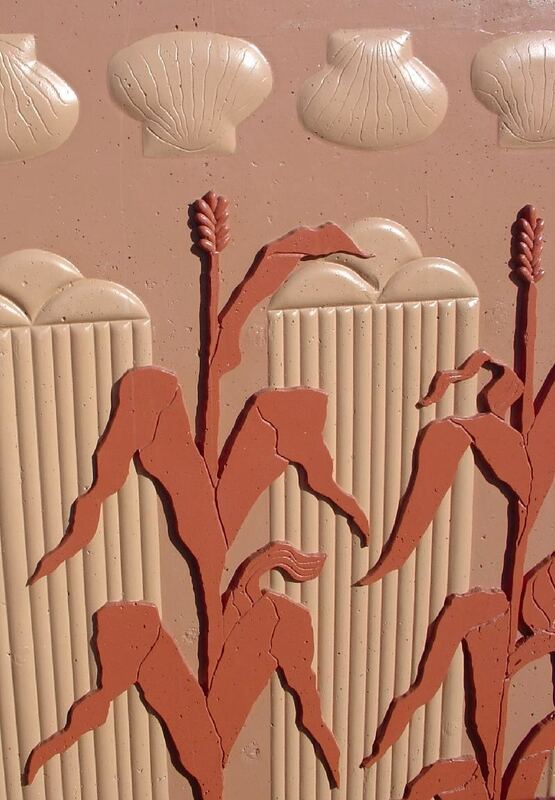 Cast-in-place architectural concrete usually requires a mix which has very good workability. Proper vibration will reduce the risk of air bubbles, honeycombing, and surface blemishes. Architectural concrete should be placed using a pump and an elephant trunk to avoid mix separation splatter and trapped air. Most form liners cannot withstand a pour rate in excess of 4 to 5 feet per hour. Generally, the more texture and relief on the form liner, the slower the concrete must be placed. If a plasticizer is used, the rate of pour may have to be reduced to limit form pressures. In placing concrete for tilt-ups, make sure that all joints are sealed and/or taped and avoid stepping on the form liner as much as possible. All dirt, debris, and water should be removed before placing concrete. Follow ACI recommendations for the vibration of the concrete. When attaching the plastic liners to the form, the first step is to identify the side to be poured against. The side facing the formwork has a smooth shiny surface; the concrete side has a slight “hair cell” appearance. The most common method to attach the liner to the form is with screws or nails. Tek Drywall screws work well for this application and the nails or screws should be placed every 6″-12″on center around the perimeter and 18″-24″ in the center of the liner. Other options include pneumatic staples, which don’t hold as well so they should be applied closer together, and double sided tape. The recommended method for tilt-up application is wooden dowels inserted into the casting slab. “Formica top” adhesive is suggested for applying plastic liners to steel forms. Urethane liners can be attached to the front or the back of the forms with bolts or lag screws. The head of the bolt can be screwed into the face of the liner and covered with a silicon or urethane caulking material. Or, for easy attachment, Spec Formliners can manufacturer your liners with T-Nuts according to your specifications where the head of the bolt can be screwed into the imbedded threads in the back of the liner. Spec form liners are designed to work with nearly every forming system and for a variety of applications. Our material options make it easy for Spec’s liners to be adapted to every project. The form liner application is most important in determining which material will work best for you. Of our two plastic liner options, the multi-use material is best for Cast-In-Place projects, or projects where the liner can be reused multiple times with little cutting, whereas the single-use plastic is best for Tilt-up projects or projects that require no re-use and a lot of cutting. Our urethane is ideal for precast projects, heavy highway projects, and projects that require custom sized or large panels. Additionally, we are now featuring our Semi-Elastomeric material which is perfect for custom shapes and sizes that need fewer re-uses than the urethane would provide.